OK, so if you’re like most people, when you think of Florida, you think of three things: beaches, sun, and theme parks. Florida, from Pensacola to Miami and Jacksonville to Naples, is packed with tourist attractions, side-stops, and points of interest a-plenty, and among those, theme parks have been the tourism bread and butter of the state since the middle of the 20th century. While Florida’s first commercial theme park, Cypress Gardens, is no longer with us in its original form, a diverse array of other tourist hubs have sprung up from the swamp lands and scrub pine stands that once dominated the landscape of Central Florida. Let’s take a fun road trip along Interstate-4 and take a look at Florida’s plethora of theme parks. We’re starting off in Tampa at Interstate-4 Mile Marker 3, and our first trek is at what is one of the state’s oldest theme parks, Busch Gardens. Opened in 1959, the now 335-acre park started out as a small bird aviary centered around Anheuser-Busch’s Tampa brewery. Today, Busch Gardens is primarily home to exotic animals from Africa and other parts of the world and death-defying rides. Busch Gardens rivals other parks in the ride category with several large roller coasters, including Kumba, Montu, Gwazi, Shei’Kra, and the park’s newest roller coaster – Cheetah Hunt, a triple-launch roller coaster replicating the moves of a cheetah stalking its prey. If you’re not a ride enthusiast, you’ll be sure to enjoy viewing the many beautiful creatures that roam their naturally themed habitats, including Myombe Reserve (gorillas and chimpanzees), Walkabout Way (kangaroos and wallabies), and Cheetah Run. There are also several exceptional dining opportunities in the park, including the Crown Colony House and Stanleyville Smokehouse, and a multitude of shows and roving entertainers. For more information and current admission prices, call 1-888-800-5447. The car is slowing down along Interstate-4 at Mile Marker 55, where we take a right turn and travel along a stretch of citrus grove-lined U.S. 27 before winding up at LEGOLAND, Florida’s most recently built theme park. Having sprung up on the former grounds of Cypress Gardens, LEGOLAND is the newest addition to a family of parks loved by children of all ages around the world. Get to watch how LEGO blocks are made during a simulated factory tour in Fun Town, ride the double-decker Grand Carousel, or challenge the Dragon roller coaster in LEGO Kingdoms. You can also hop on the back of a dinosaur as it stampedes along its wild, wooden path on Coastersaurus; soar the skies in Flight School; or let your youngsters explore DUPLO Village. Call 1-877-350-LEGO (5346) for more information and ticket prices. We’re going to hop back onto Interstate-4 and travel a few miles east to what many say is one of the happiest places on earth – Walt Disney World. The home of the EPCOT, Disney’s Animal Kingdom, Disney’s Hollywood Studios, and, of course, the park that started it all in 1971, the Magic Kingdom. Nearly 30,000 acres in size, Walt Disney World is not just a resort, it’s a realm all its own, left un-encroached by the suburban sprawl, highways, and strip malls that have engulfed most of Central Florida. While Cinderella’s Castle (Magic Kingdom), Spaceship Earth (EPCOT), Tower of Terror (Disney’s Hollywood Studios), and the Tree of Life (Disney’s Animal Kingdom) rise above their respective parks in physical stature, there are tons of surrounding attractions at each park that will delight the young and young at heart. Whether you’re going for a spin on the Magic Kingdom’s Mad Hatter’s Tea Cups, taking life in the fast lane on EPCOT’s Test Track, touring the back lots of Disney’s Hollywood Studios, or having a close encounter with the exotic kind at Disney’s Animal Kingdom, a trip to Walt Disney World Resort makes memories you won’t forget. To learn more about the Walt Disney World Resort and its many parks and hotels, call 1-407-939-6244. Don’t forget to load up on Disney fun facts before making the trip… Ever hear about hidden Mickeys? A little further along Interstate-4 eastbound, and we arrive at SeaWorld, just a dolphin’s leap away from Mile Marker 71. From dolphins to eels and, of course, Shamu, there are hundreds of aquatic creatures to be seen up close in habitats that emulate their natural environs. While SeaWorld is dedicated to preserving aquatic life, the park also is home to a small but incredible selection of thrill rides, including the Kraken roller coaster, the water coaster Journey to Atlantis, and Manta – a manta ray-themed, pulse-pounding roller coaster that sends you flying through the air and over the water head first. To learn more about SeaWorld, contact them at 1-888-800-5447. Our road Florida theme park road trip ends at Interstate-4 Mile Marker 75, where the movies come to life at Universal Orlando Resort. 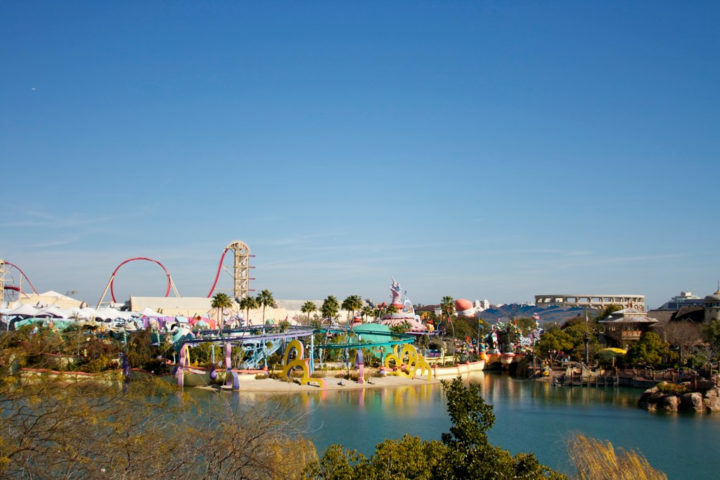 Comprised of two separate theme parks, Universal Studios and Universal’s Islands of Adventure, Universal Orlando Resort features more things than can possibly be seen or done in but a single day. Universal Studios features King Kong 360 3D, Jurassic Park: The Ride, Revenge of the Mummy, The Simpsons Ride, Hollywood Rip Ride Rockit, and several other immersive attractions. Even if you aren’t one for white-knuckle thrills, you’ll still have fun soaring with everyone’s favorite alien on E.T. Adventure, watching Jake and Elwood stir some soul at the Blues Brothers Show, and laughing it up with Shrek 4D. Just steps away is Universal’s Islands of Adventure, where hair-raising rides abound, including The Incredible Hulk Coaster, Dudley Do-Right’s Ripsaw Falls, The Amazing Adventures of Spiderman, and Doctor Doom’s Fear Fall. Muggles are welcome to explore The Wizarding World of Harry Potter, where you can drink Butterbeer, get your own wand at Ollivander’s, and soar through and over Hogwarts Castle on Harry Potter and the Forbidden Journey. For admission prices and other information about Universal Orlando Resort and its attractions as well as buying a front of the line pass, call 1-407-363-8000. If we were to continue heading east along Interstate-4, you would pass countless acres of woodland, several lakes, and picturesque wetlands before eventually hitting Mile Marker 132 — that’s where I-4 meets up with Interstate-95. Of course, you could head south toward Miami and the Florida Keys, trek northward toward the rest of the United States, or even take some trips to see the beautiful Florida state parks, but those would require separate blog posts now, wouldn’t they?